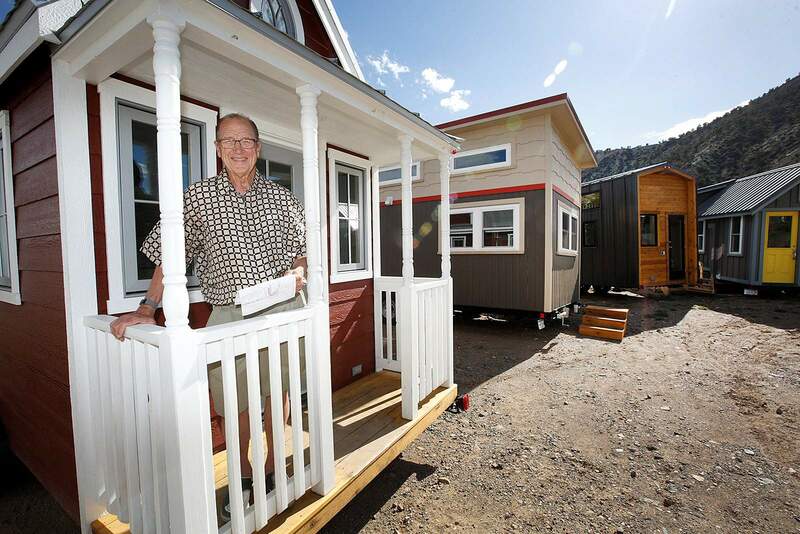 Bob Lieb, in one of his tiny homes on Wednesday, would like to create Colorado’s first tiny home community, Escalante Village, located at 224 Baker Lane, between Walmart and Escalante Middle School. Former La Plata County Commissioner Bob Lieb is proposing Escalante Village, located at 224 Baker Lane, between Walmart and Escalante Middle School. Greg Parham, owner of Rocky Mountain Tiny Houses, works on one of his custom tiny houses on Wednesday in Durango. Parham’s firm, located in Durango, built 17 tiny homes in 2017. 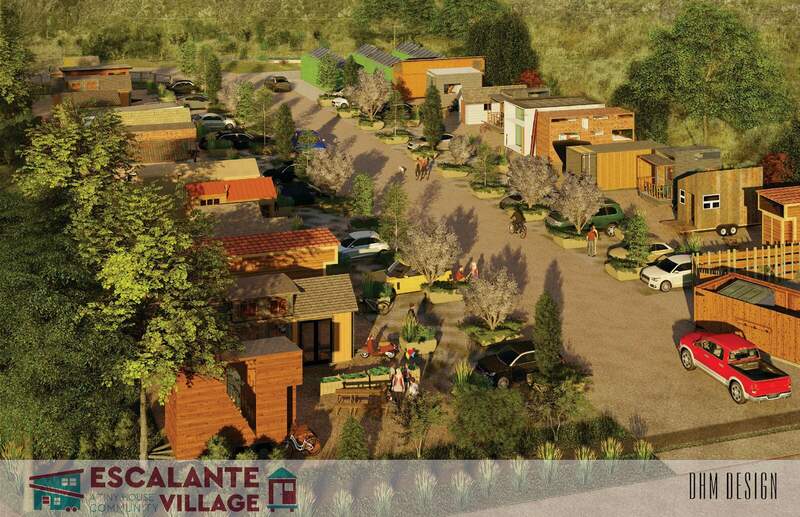 An architectural rendering of Escalante Village at buildout. A growing movement to save money and simplify life may become more reality than movement if a former La Plata County commissioner’s proposal to create a community of tiny homes earns favor with the city. Bob Lieb is proposing a community of 24 tiny homes on 1.7 acres at 224 Baker Lane, sandwiched between Escalante Middle School and Walmart. It will include a community garden and a recreation area. Each 20-foot lot will have space for a patio and movable landscaping, in planters, that will allow easy ingress and egress for the little homes on wheels. The landscaping, which can be moved by forklifts, ensures that another characteristic of tiny homes, their mobility, will not be compromised by placing them in a subdivision that aims to meet city standards and provide full utilities. On May 21, Lieb will go before the Durango Planning Commission with an annexation petition and a presentation of conceptional design to begin the process of city approval. If all goes well, he’d like to be accepting tenants for his spaces by the end of summer. He has six tiny houses on site that will be available for rentals, but most spaces will be reserved for people who own their tiny houses, which typically offer about 180 square feet to 350 square feet of living space. Rental costs have not yet been determined, Lieb said, because he needs to go through the city approval process to determine his final development costs. Ally Shea and her husband, Kevin Martin, decided to take the tiny home route in life in January after realizing that their lifestyle in Seattle was too limiting and too taxing. Kevin rarely got time to see his twin 2-year-old boys, Bodhi and River. After watching television shows on tiny home living and joking about adopting the lifestyle, Shea and Martin saved for six months and then ditched their big Seattle house and its onerous mortgage and hit the road with Bodhi and River. Bodhi and River call their house “our tree house,” she said, and added that the important thing about tiny home living is that it really works best when nature becomes your living room. They are documenting their travels on a blog, tinyhousetwintravels.com. Even in Seattle, she said her boys were quick to get cabin fever, and most daylight hours were spent in parks around town with the boys enjoying nature, and the tiny home movement seemed a natural progression. The feeling of community is strong among tiny home owners, Shea said. One of the most exciting aspects of living in Lieb’s development is that it will create a vibrant community of neighbors who rely on each other and help each other out. “When I lived in Seattle, I would wave to my neighbors, but I really didn’t know them, and I never had a meal with them,” she said. She said she has made deep friendships with people while staying in tiny homes during the family’s trek down the coast from Seattle to San Diego, then through Arizona to Durango. The family is currently set up near Silverton. “In tiny homes, people are involved with each other. They help each other,” she said. “It goes back to a time when it did take a village,” she said. 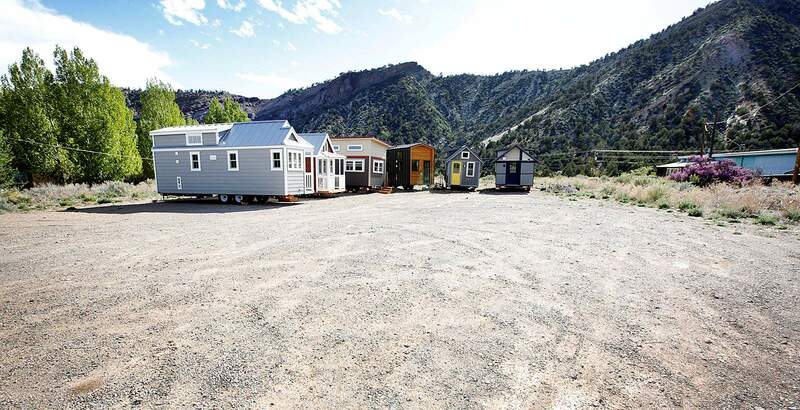 There’s not one particular demographic that has emerged as the most interested in tiny homes in Escalante Village; instead, Lieb said interest has come from widows and widowers to young professionals just out of Fort Lewis College and looking for an affordable way to stay in town. Because a single demographic group has not been established for the 24 available spaces in the proposed subdivision, Lieb has left open final plans for an amenity area, which could be a playground or a picnic area, depending on the wishes of the eventual tenants. Greg Parham, owner of Rocky Mountain Tiny Houses, has been building customized little abodes in Durango for five years, and has witnessed the tiny house boom. 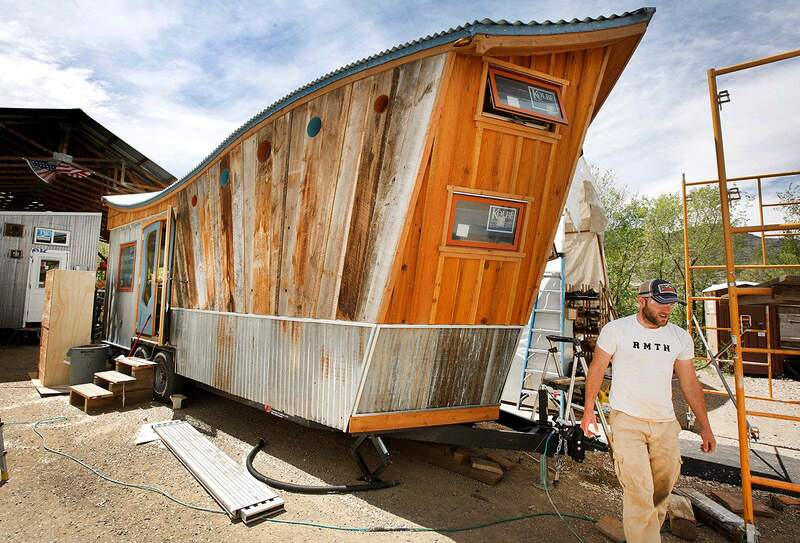 When he started building in 2013, he estimated there were 20 firms nationwide constructing tiny homes. Now, he believes there are 500. His niche is building completely customized tiny homes, but he also sells several models of pre-designed tiny homes that can be semi-customized. He also sells tiny home kits, designs for tiny homes and offers workshops and consulting on tiny home living. “Tiny homes are so personable for the inhabitant that there’s enough demand for customized ones that it keeps us busy,” he said. Parham currently builds 17 homes a year. He said he could expand his business if he could find land to expand his shop and warehouse space, which is tight in Durango. The most expensive model he has ever sold was for $165,000 – prices go up according to the level of appliances and material used in the build. The average tiny home, he said, sells for between $60,000 and $75,000 and is 8 feet wide and 24 feet in length. He has noticed that members of the military find that tiny homes fit their lifestyle. “They get stationed around the country, and it’s a huge hassle to get out of a house and into another one every two or three years,” he said. The two big attractions of tiny homes, Parham said, is their affordability and mobility. A big “sub-tier” for many clients, he said, is the philosophy of living a less wasteful and more sustainable lifestyle – a minimalistic approach to life that not only puts less stress on the planet but also on the person. The site for Escalante Village subdivision, near the Purple Cliffs, has easy access to the Animas River Trail and is across U.S. Highway 550 from the Carbon Junction and Sale Barn trail systems. An obvious appeal for tiny homes is their cost, which Lieb estimated can begin at $30,000, and owners can cut the cost even more by buying kits and assembling the tiny home themselves. Lieb is planning an open house at Escalante Village, 224 Baker Lane, on June 23. Traffic on Baker Lane peaks when school starts and ends at Escalante Middle School, and that peak traffic time has emerged as one key sticking point to getting Escalante Village approved. But Lieb said once Escalante Avenue is extended to the south, traffic issues should ease. He said the peak traffic comes only for a few minutes as parents drop off their children in the morning, and lasts a little longer in the afternoon when they pick them up. Shea wishes Lieb well in his quest for approval from the city of Durango. She said tiny homes give her generation an affordable option early in their careers when they are forced to make hard choices if they want to own a home. parmijo@durangoherald.comThis story has been updated to remove references to Escalante Village being the first tiny home community in Colorado.